The East Bay Regional Park District has gotten off to a quick start on land acquisition and local grant initiatives. The Chabot Dunsmuir property in East Oakland will connect several existing open space areas. In November 2008, the East Bay Regional Park District faced what must have seemed like a daunting proposition. In the midst of a deepening national recession, it needed at least two-thirds of East Bay property owners to agree to tax themselves for the expansion of an already massive regional park system. Not only that, but the $500 million bond measure was the largest proposed by the district in its 74-year history. It was also the first to face an organized opposition campaign. Yet the district itself was created in the midst of the Great Depression with the support of more than seven in ten voters, and Measure WW followed suit. With 72 percent of the vote behind it, the measure extended the parcel tax first established by Measure AA for another two decades. Just over a year later, WW is beginning to bear fruit. The first major victory came last August, when the East Bay Regional Park District Board of Directors voted to purchase a 64-acre plot of land between Highway 580 and Anthony Chabot Regional Park near the Oakland-San Leandro border. The privately owned property known as Chabot Dunsmuir contained two large residential tracts that were mapped in the 1940s and 1950s but never subdivided. 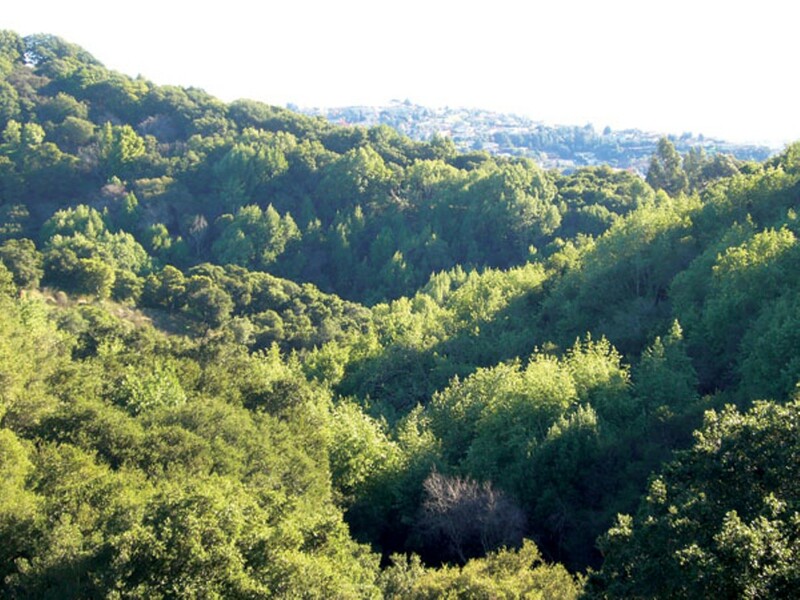 In the park district's hands, it will connect several open space areas including Oakland's Dunsmuir House and Gardens, Dunsmuir Ridge Open Space, and the Lake Chabot Golf Course. Chabot Dunsmuir's footprint on the map is relatively slight, but ecologically it offers considerable value. Located on a prominent ridgeline in East Oakland, the tract contains two significant tributaries of San Leandro Creek, one of the few remaining above-ground urban creeks in the East Bay. Its preservation as open space will protect some of the last oak and riparian woodlands and habitat in Oakland, said watershed program supervisor Lesley Estes. And it affords excellent views of East Oakland and the San Francisco Bay. Although the park district fronted two-thirds of the $2.9 million price tag, ownership and maintenance responsibilities will fall to the City of Oakland, which put just over $1 million toward the purchase in a joint venture with the district. The park district will build and maintain a trail through the property that connects the Sheffield Village neighborhood of San Leandro to Lake Chabot. More than half of the proposed 1.6-mile trail already exists in the form of a dirt road, but there is no scheduled date for completion. The property has faced potential residential development on numerous occasions — including as recently as July 2006. Although the economic downturn may once have threatened Measure WW's passage, it has turned out to be a boon for the East Bay Regional Park District. "We're one of the few remaining buyers with funding," said land acquisition manager Nancy Wenninger. "Some developers are actually walking away from properties that they had bought or optioned for future development. ... Measure WW is keeping us alive and allowing us to continue with land acquisition. The timing was very good and will allow us to take advantage of the real estate market. In fact, I've never been busier." When WW went on the ballot, the regional park district was already the nation's largest such district at more than 98,000 acres. A second WW-funded purchase in September pushed that number over 100,000: the 1,476-acre, $6.6 million Tyler Ranch located adjacent to Pleasanton Ridge near Sunol. It's the district's largest acquisition in nearly twenty years, although it won't be complete until 2012. While these acquisitions are the only two yet completed with Measure WW funds, more are on the way. A project list first circulated in 2008 includes 67 items. By the measure's conclusion in 2028, the district could add tens of thousands of acres and at least ten new parks to the system. But all this new land may have a downside. While Measure WW has ensured the park district's coffers are well-stocked as far as land acquisition goes, its operating budget has suffered. "In general, we're quite pleased with how it's going," said Dave Collins, assistant general manager of finance for the park district. "The part that's not going to plan is this whole economic downturn. We have to consider not only the cost of the project, but also the cost of operations when it's complete." Collins says the district cut its operations budget by 7 percent in 2009 and will do so again in 2010. All told, he anticipates a 15 to 18 percent drop in the district's operating budget before the economy turns around. "We have this great program, but at the same time we do have to be cautious about what we open to the public," he said. So it'll likely be a while before East Bay residents get to enjoy the new open space. "It's a great time to purchase property, so we're making every attempt to do so as the opportunity arises," said Collins. "But the transition from a land bank to an open park may take a little longer than we like." This past summer, the district issued its first series of WW bonds, freeing up a total of $80 million. But only $15 million was earmarked for land acquisition; the remaining $65 million went to the measure's local grant program, which will ultimately account for 25 percent of the total $500 million and was frontloaded to give East Bay cities an opportunity to pursue their own park and recreation projects. A number of East Bay cities took advantage of the district's first local grant cycle. Following the March 31, 2009 deadline, the district considered 48 applications from fifteen agencies and approved 39 of them, valued at nearly $29 million. Emeryville was granted $194,000 for capital improvements at Horton Landing Park (out of its total $445,000); Richmond got $330,000 of its $4.7 million for the construction of three new Bay Trail segments; and the Hayward Area Recreation and Park District got $775,000 of its $12.7 million for construction of a public meeting facility. But the biggest response by far came from Oakland, which successfully applied for $14 million in funding for twelve distinct projects. As local grant program allowances were based on population, Oakland is still due another $5.2 million. Yet among the 44 East Bay agencies allocated funding, only Concord came anywhere close in terms of first-year response with ten approved projects valued at $2.3 million. "The City of Oakland was prepared to move quickly," said Lily Soo Hoo, Oakland's project manager for facility planning and development. In 2007, the city council identified a list of priority projects, said Soo Hoo, and by the time WW rolled around, city staff had already performed the requisite prep work. Some of the city's projects recently approved for funding through Measure WW include $500,000 for improvements to the Oakland City Stables, $3 million for extensive public field improvements, and $6 million for the East Oakland Sports Center. But Soo Hoo says the city council has identified more than $100 million in additional parks and recreation projects it hopes to complete, and Measure WW's $19 million will put only a small dent in that. "It's a starting point," Soo Hoo said. "We wanted to address the immediate needs first and that's all we could do at this point. We'll just have to work our way through a little bit at a time. It's wonderful to at least have a place to start."